For my Mother’s Day outing one spring, our family decided to go for a hike at Tommy Thompson Park here in Toronto. It is reputed as a birdwatchers’ paradise, and I would have to agree with whomever made that proclamation. 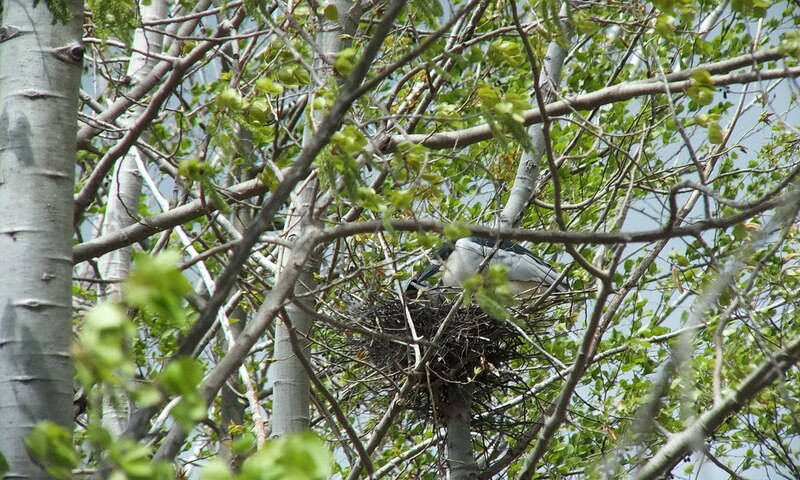 One of the most thrilling sightings we made that day was a nesting colony of Black-crowned Night Herons. We saw at least 12 pairs of these magnificent birds, some on their nests, others perched in the trees. Tommy Thompson Park is located on Toronto’s waterfront on a man-made peninsula known as the Leslie Street Spit. It is minutes from downtown Toronto and extends approximately five kilometres into Lake Ontario. We experienced the most unusual weather the day we visited. For May 12, the conditions ranged from full sun and blue sky to rain, freezing rain, sleet and even small hailstones. It made for quite the adventurous outing. Our group was on foot because Tommy Thompson Park is a car-free zone. Excellent cycling paths and alternate walking trails run the full length of the spit. Nature has transformed the once barren place into a unique urban wilderness. The park consists of a mixture of wetlands, meadows and forests that all support many threatened and unusual species of wildlife and plants. After hiking for 2 hours, the trail brought us to a birdwatching blind erected at the edge of a forest. 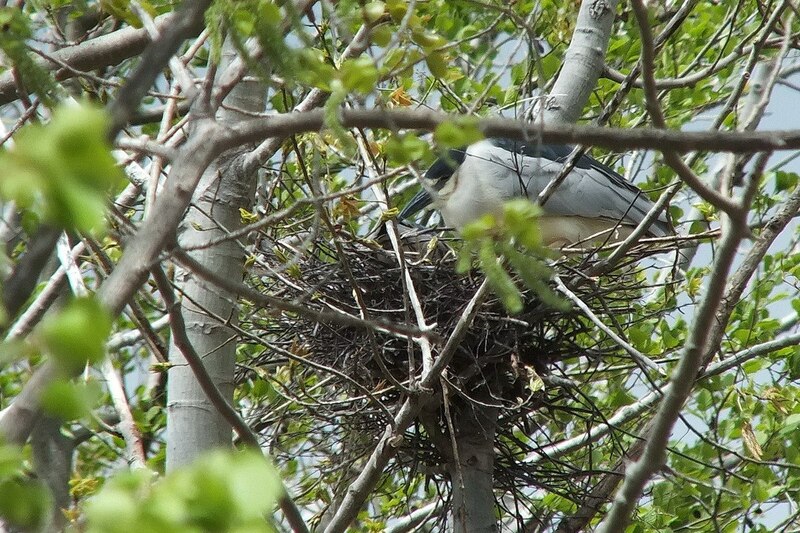 From our hidden observation point, we were excited to see a Black-crowned Night Heron roosting on its nest. The sandy peninsulas of the park have thickets of eastern cottonwood trees, poplars and willows, all great for sheltering these stunning birds. It was soon after that when we realized the trees were full of Night Herons. These crow-sized birds seldom forage during the day, preferring to roost in trees. About sunset and in the gathering dusk, they make their way on broad wings to nearby feeding grounds, hence the name, Night Heron. They primarily feed on fish, but will also take frogs, crayfish and even small rodents. 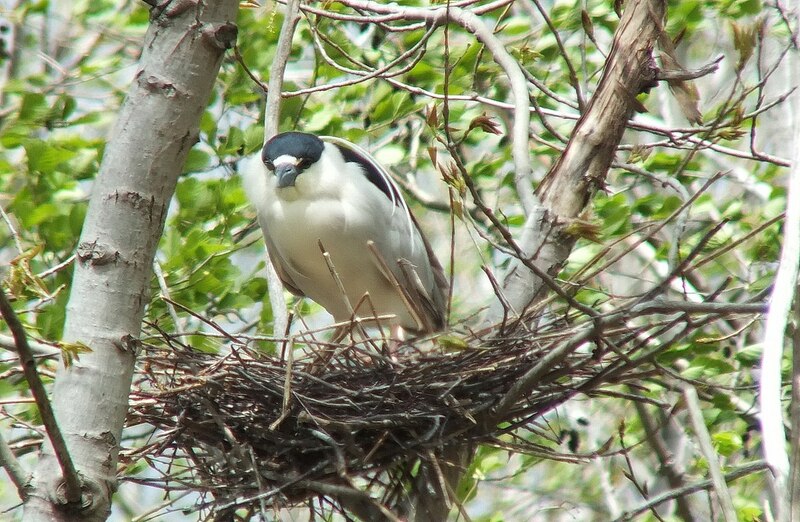 Black-crowned Night Herons get their name from their black crown and back, although both have a greenish gloss. In the light in which we were shooting, the back and head looked more like teal blue. 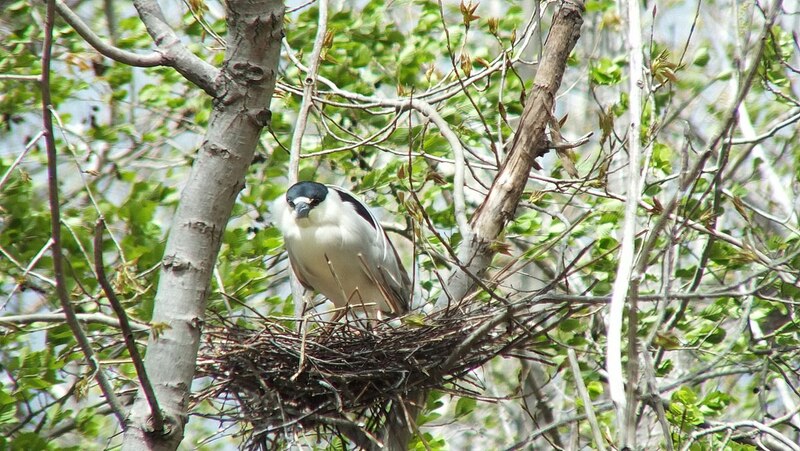 Black-crowned Night Herons nest in colonies. Their nest is composed of sticks and is almost always in a tree. 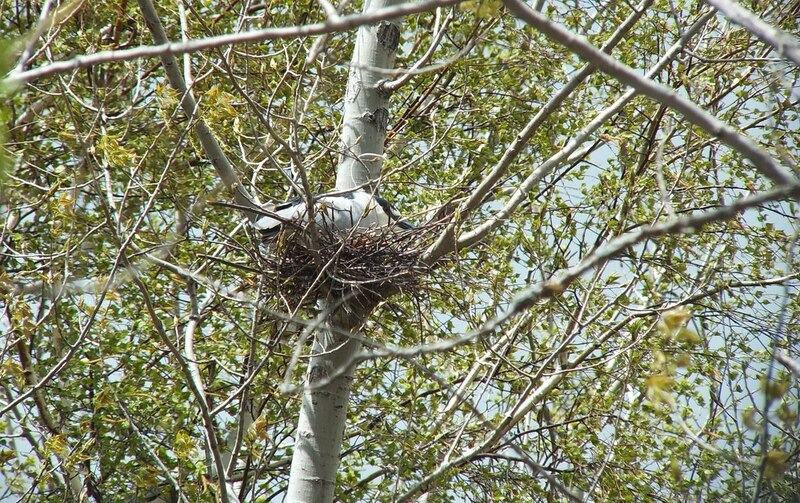 It would not be uncommon to see more than a dozen nests in one tree. 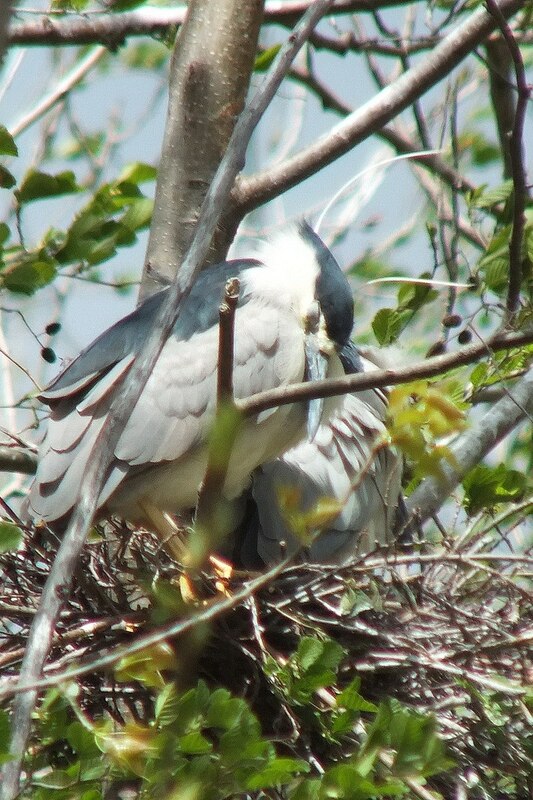 Black-crowned Night Herons have between 2-4 slender long white feathers extending back from behind the head. These are erected in greeting and courtship displays, but on the day we saw the birds, those feathers were flopping about in the strong winds. 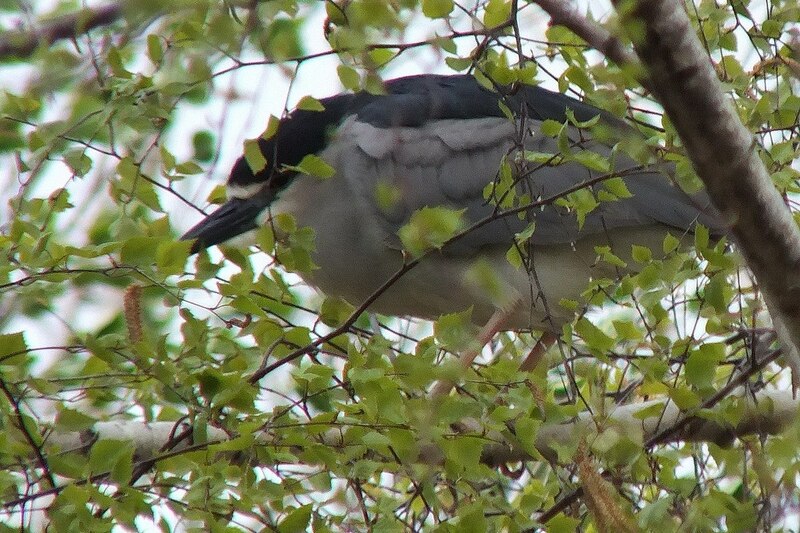 In this photo, we almost have a clear view of the Night Heron’s red eye. Juvenile Night Herons have a yellowish orange eye. While observing the Night Herons, we couldn’t help thinking that some of the nests seemed rather small and ill-constructed. 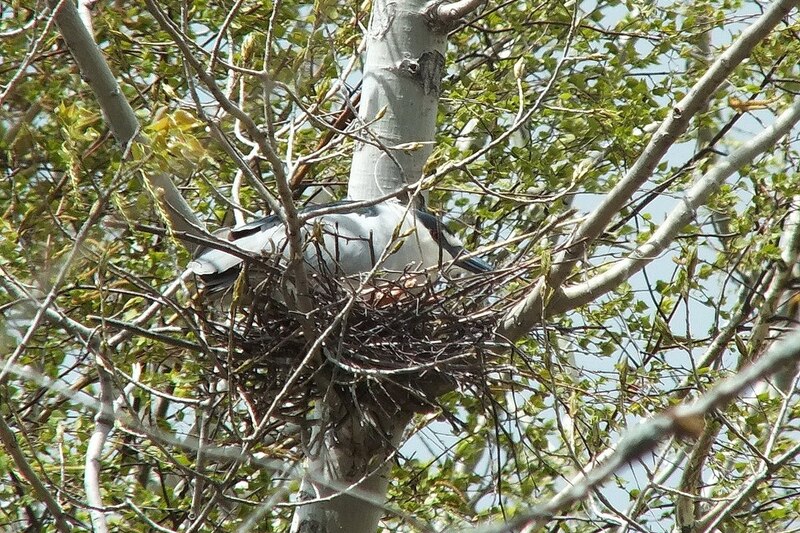 Having said that, male Night Herons use their nests to attract a mate, and the same nest may be used for many years. I guess they aren’t as fragile as they look! Females and male Night Herons look alike, although the female is usually a bit smaller than the male. 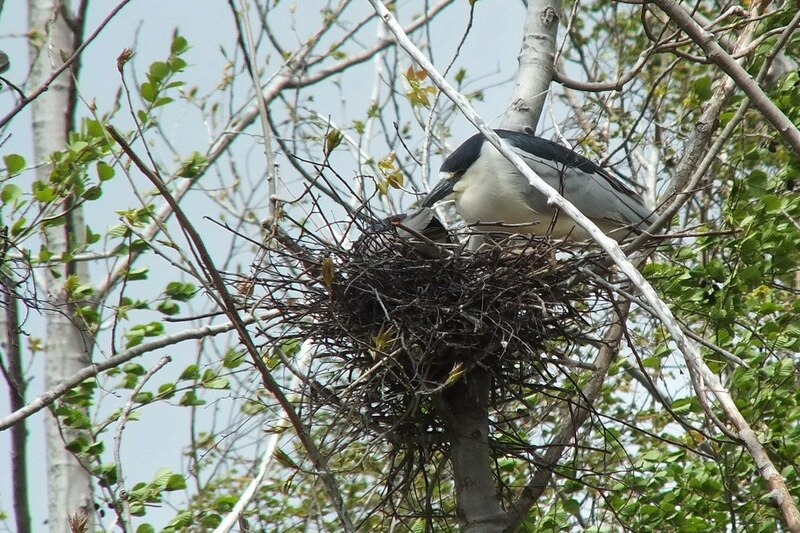 It seemed that both the male and female shared occupancy of the nests as we looked on. The contrasting black back and all-white underparts identify the adults. In this photo, you can really appreciate the soft grey plumage of the neck, wings, rump and tail. Just above the stout beak is the characteristic white forehead. 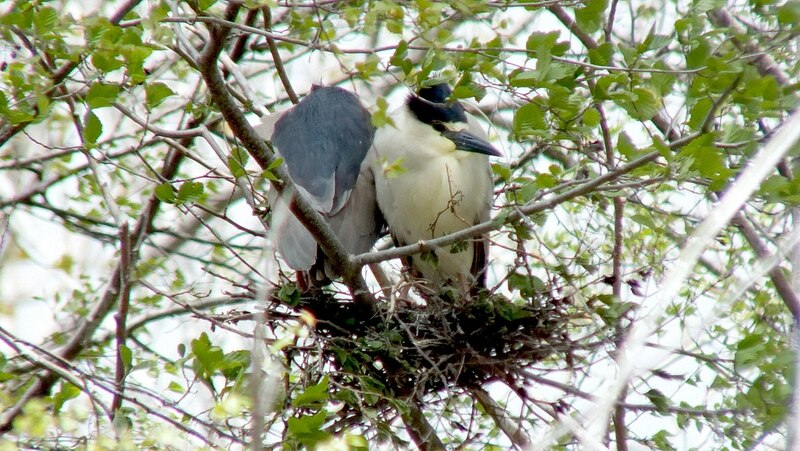 The Night Heron’s thick black bill is shorter than the beak of other herons, and it is used to grab rather than stab prey as is common with other heron species. I was overcome with joy observing so many Night Herons in one place. The forest was cordoned off to prevent intruders from disrupting the nesting birds, and will remain so for several months, but the blind was close enough to allow good visibility. 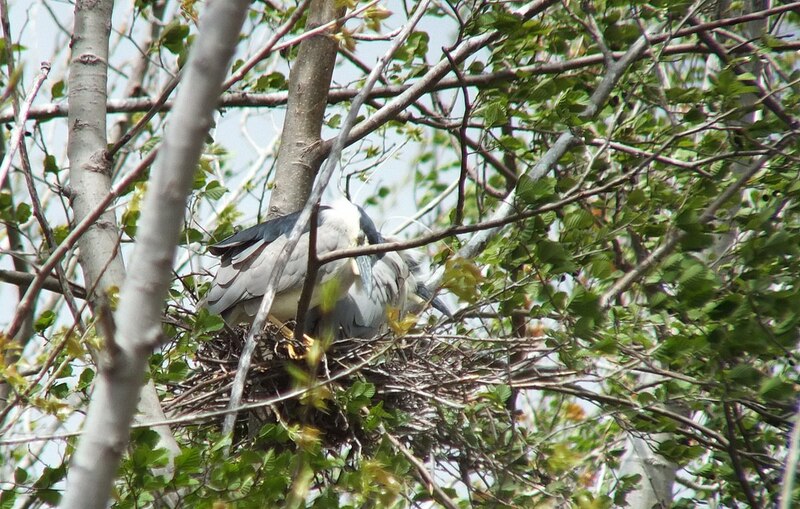 We later learned that those nesting birds of which we had a view represented a mere fraction of the Night Heron colony in Tommy Thompson Park. 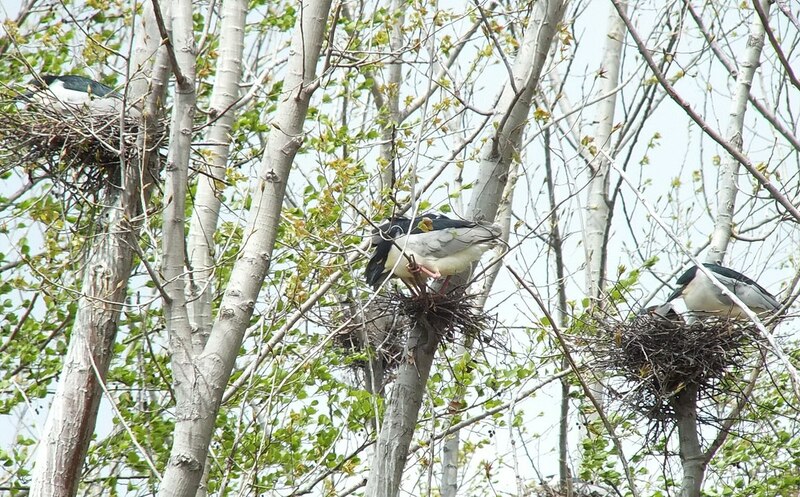 The Spit has the largest colony (1,200 pairs) of Black-crowned Night Herons in Ontario. That colony is one reason the park has been designated by BirdLife International as an important bird area of global significance. 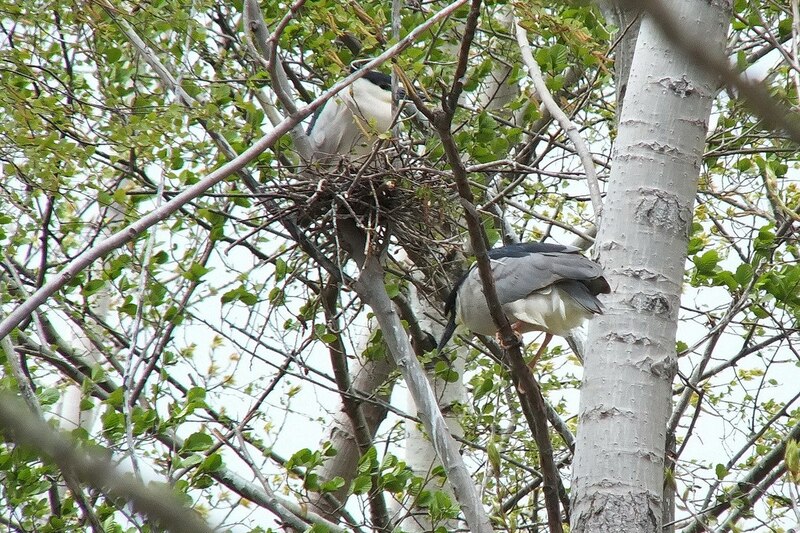 Overall, Black-crowned Night Heron populations are stable. Because of wide distribution and feeding habits, they are an excellent indicator of ecosystem health, which would explain why wildlife, and especially birds, flourish at Tommy Thompson Park. 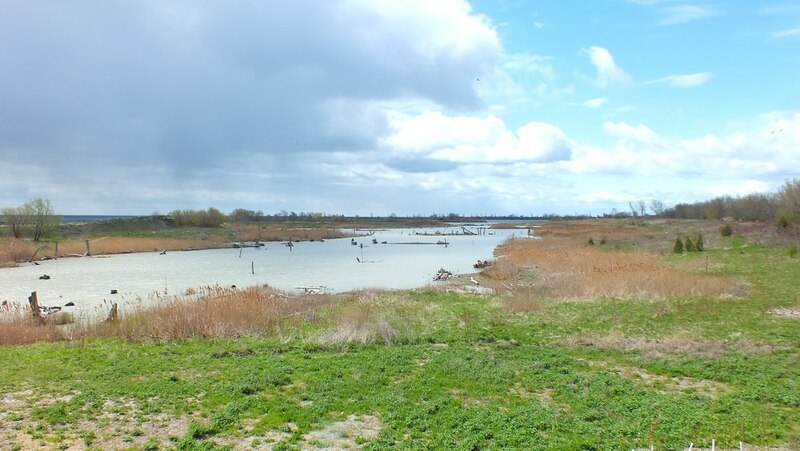 It is one of the best nature watching areas in the Greater Toronto Area. 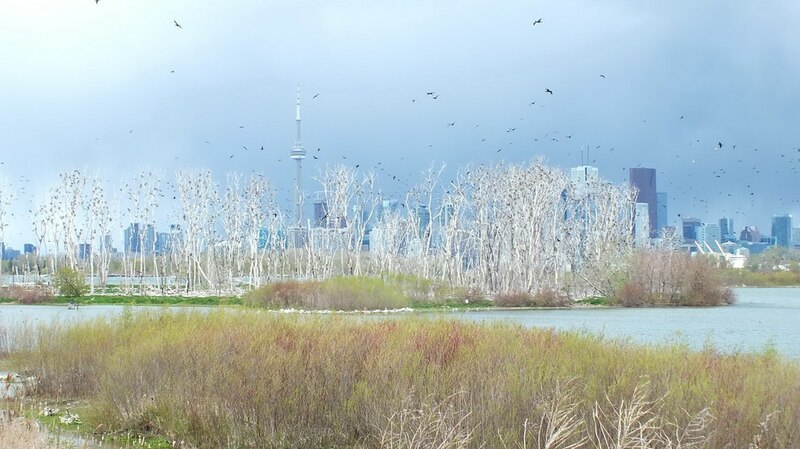 The wildflower meadows, coastal marshes, cobble beaches, sand dunes and cottonwood forests of the Leslie Street Spit represent varied habitats that are home to many birds and other animals. About 300 species of birds have been sighted there, granted many during migration, so it is one of the key spots in the province for bird watching. We certainly would agree with that! 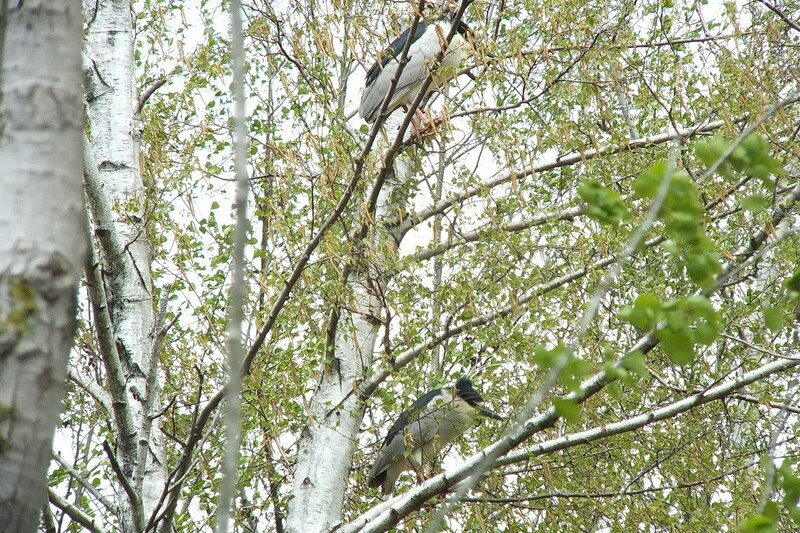 I have seen black-crowned night herons, in willow trees. Every single branch had a black-crowned night heron on it, that it looked like a Christmas tree decorated with black-crowned night herons. That’s great, Tim. Black-crowned Night Herons are a very attractive bird. It is so nice to come across so many in one place. We have seen two individuals in the past, both perched in a body of water waiting to catch a fish.